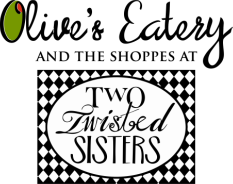 This restaurant, and the Twisted Sisters shops, are absolutely lovely, as are the owners, Terri and Barb (nothing "Twisted" about them!) Everything was perfect for the bridal shower I had the privilege of hosting in Olives, from the beautiful fun decor, the seamless service, and the incredible food. This is one of my favorite restaurants, so to be able to host an event there was wonderful. You can't go wrong dining here or planning an event. It was truly an enjoyable time, as always. Thanks, Barb and Terri for making it a memorable day for my niece-to-be. This place is magic. The food is phenomenal and the shops are amazing....especially Two Twisted Sisters and the prices are so reasonable. I come to Syracuse 2 times a year and if I could chose just one place to go it would be here. I simply cannot thank you and Barb ENOUGH for the BEAUTIFUL and beyonnnnnd TASTY and TASTEFUL job that you did for me at Red Mill, and more importantly for my friend Caroline!! The ladies were just blown and away and Caroline felt soooooo special and spoiled! Mission accomplished on all fronts!!! You were both so incredibly fun and easy to work with I felt as if in the end, I'd made two new fabulous friends whom I look very forward to seeing and working with again! Not sure there's a bigger Win Win for a client than that! So I humbly thank you.... for your time, your willingness to put up with and work with me, listen to my "vision" then produce it, your attention to detail... Those first 3 seconds every one of my ladies walked in and just Ooooohhhd and Ahhhhhhhhd was priceless, music to my ears! Consummate professionals from the moment I reached out to you to the very end... how very lucky am not just I, but this entire community to have you Two fabulous Twisted Sisters in their very own backyard!!! Best to the both of you for a wonderful and warm holiday season full of good cheer, peace and health! Salud! We have eaten lunch here three times since the new owners have taken over. Recently we took our granddaughter to celebrate her Dean's List status. She is not an eclectic diner but she was very pleased with her lunch. We try lots of new things and we loved our lunch also. The orzo side is wonderful. Everything is fresh and beautifully prepared. Last Friday night we had the pleasure of trying their new dinner menu. Wow! It is light fare but plenty - the roast beef with carmelized onions was perfect and the melange of cheeses in the Ultimate Grilled cheese was amazing. We also loved the lemon-ginger salad dressing - unique and wonderful. We ate outside in the grape arbor. Charming!